Key Takeaway: Russia will not act decisively either against or in support of the movement for Kurdish independence in Iraq. Russia will instead posture as neutral regarding the potential declaration of independence by the Kurdistan Regional Government (KRG) given Moscow’s competing interests and partnerships with Iran, Turkey, and KRG President Masoud Barzani. Russia will nonetheless position itself to seize low-risk opportunities as the U.S., Turkey, and Iran take steps to isolate Iraqi Kurdistan. Russia will only play a peripheral role in Iraqi Kurdistan amidst the potential declaration of independence by the KRG. Moscow will continue to remain neutral regarding the crisis in order to position itself to take advantage of U.S. policies that may alienate Barzani and Iraqi Kurds. Russia is poised to seize economic opportunities with the KRG, but only those that pose little risk to its relationship to Iran or Turkey. These opportunities may position Russia to play an increased role in post-ISIS Iraq in the future, however. Russia’s vested interests in Kurdistan are primarily economic. Russia has entered into a number of energy agreements with the KRG including the funding of gas pipelines, exploration and investment in oil blocks, and pre-financing of oil exports. Moscow also has political interests in Iraqi Kurdistan and maintains historical relations with the Barzani family as Masoud Barzani’s father, Mustafa Barzani, lived in exile in the Soviet Union in the 1940s and 50s. Russia will nonetheless seek to balance the protection of these interests with the promotion of Moscow’s role as a security guarantor and economic partner in Iraq, particularly in the event of an outbreak of violence in Iraqi Kurdistan. Moscow’s policy towards Iraqi Kurdistan will remain patient, opportunistic, and reactionary. Russia has set conditions for future cooperation with both Arbil and Baghdad in recent months. As a result, the Kremlin simply has to wait for opportunities to arise within the Government of Iraq or the KRG. 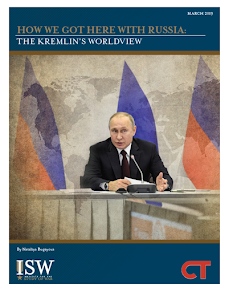 Russia’s neutrality will prevent the alienation of any potential or current allies, allowing Moscow to capitalize on the outcome of conflict, while avoiding blame for any potential violence. Russia is posturing to compete with the U.S. as an ally of Barzani, for example. However, the U.S. remains far closer to Barzani as of October 2017. Russia is unlikely to use military force in Iraqi Kurdistan, despite recent deployments and exercises by Iran, Turkey, and Iraqi Security Forces along the Turkish and Iranian borders with northern Iraq. Instead, Russia may seek to increase diplomatic engagement with Iraq, Iran, Turkey, or the KRG in order to secure the Kremlin’s energy interests in the case of an outbreak of violence. Russia may also increase diplomatic engagement in anticipation of one of these actors becoming the key powerbroker in Kurdistan as a result of the conflict. 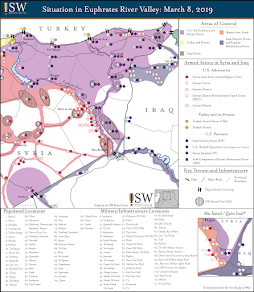 For additional reading on Russia’s likely courses of action in Iraq, read ISW and CTP’s latest Intelligence Estimate and Forecast, here.